Dam management should be considered not only where unacceptable flooding is affecting property or roads but also in the desert areas. It is aimed to make a reservoir to prevent flood or to store the water to canalize in the required direction. A big Dam is made which preserves the water coming from river or lake or even rainwater. Dam management can also be named as water asset management. It saves the city from flood and in the time requirement it will provide the water to “water requiring” cities. By employing a turbine we will be able to generate the electricity too. Our dam management system will also maintain the water at a particular level in the reservoir. For that it uses ten sensors. To depict a real life scenario we will be demonstrating 2 gates G1 and G2. These gates are controlled to restrict the flow of water to City1 and City2 respectively. When the water level goes beyond sensor eight it will be considered as emergency and both the gates G1 and G2 will open. Ten sensors are employed to sense different levels of water in the reservoir. If the water level goes below sensor level four both the gates should be closed. All these functions can be automatically/manual-controlled operation. Alarms are also attached to the system, which are audio/ visual alarms in different kind of situation it will give the buzzing sound. Both gates are timed controlled. 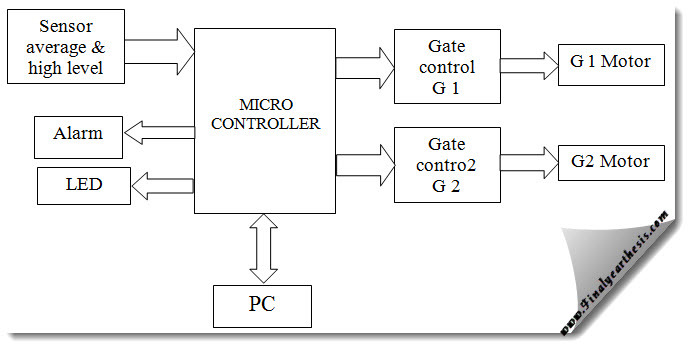 Gates are operated by the motor controlled by Micro-controller, which collects the information from the sensors. Gate statistics will determine the duration of opening and closing of gates during different seasons of the whole year. Door open and close control can be forced open and forced closed. Dam walls will support security by electrified fencing to protect the dam from outsiders. 1. Coding in Assembly for 8051 series Micro controller for time constraint acquisition and transfer of data. 3. Relay mechanism through ULN2003. 4. Stepper Motor control mechanism. 7. Alarm and LED function. The AT89C51 micro controller is heart of the system. The parallel port/serial port is used to provide the interface for input. The reason the parallel port and serial port were chosen was because virtually all computers have at least one. Hardware consists of Interface part, which communicates with the PC and data acquisition part, which extract data and send it to the interface part. Gate control circuits (motor based), controls the gates to open and close and to control the flow of water to the cities. Micro-controller set the alarm and glows the LEDs depending on different conditions .The front end will be made in visual basic. We will be using RS232 Protocol for serial port communication. With the help of visual basic we can plot the graph to show that how much water should be released/ was released in different season. Using the timer we can fix a particular time to release/ control the water flow.